Spot the difference! 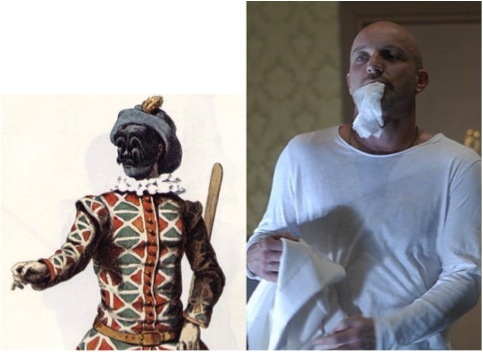 The classic Harlequin and Roberto Latini in the post-modern version. Prepositions have never been my strong point. The consequence of this is that I failed to appreciate the significance of the fact that this Venetian theatre company’s production was ‘da’ and not ‘di’ Carlo Goldoni. The first means ‘from’ the second means ‘by’. The distinction is crucial because the only connection Ken Ponzio’s version had to the original play from 1743 is in the character names and token references to the plot. In the programme notes Ponzio seeks to justify his presumptions act of literary terrorism: “Our way of perceiving comedies and tragedies has changed. Today’s expressive methods are radically different from those of Goldoni since we have experienced two world wars, been to the moon and we’ve read Samuel Beckett, Harold Pinter and Heiner Müller; our way of seeing has fundamentally changed”.